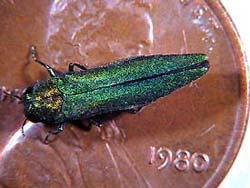 An infestation of emerald ash borer has been found in Vernon County, prompting an almost certain quarantine of Vernon and Crawford Counties to try to contain the tree-killing insect. The infestation was discovered in Victory, right on the Mississippi River about a mile south of the Minnesota-Iowa border. Mick Skwarok with the Wisconsin Department of Agriculture, Trade and Consumer Protection says, over the next few days, state and federal officials will tour the area. A larger survey will be done later to determine the age and size of the infestation. Skwarok says it&apos;s too early to say how the insect may have gotten there, and they may never know. Skwarok says the new infestation presents additional difficulties for the state. He says it&apos;s discouraging to find another infestation, so far outside of the initial discovery in Ozaukee and Washington Counties.